Each display has an overall height of 2.11m although there are options to extend this height by using a telescopic pole rather than the fixed height pole supplied as standard. It is also possible to create the banners in any width up to 80cm. If a 25cm wide or 73cm wide is needed, for instance – it can all be done easily enough as we will make the rails and graphic to whatever size you need. These displays are very lightweight and compact. The examples here weigh 1.6kgs to 2.2kgs depending upon the graphic width. A typical roller banner can weight upwards of 7kg and so if you have to carry a few banners around, this weight difference will be a big advantage. 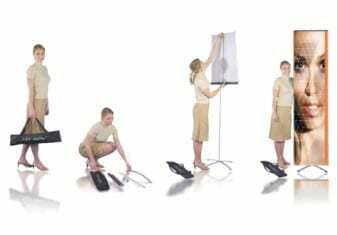 The banners are very lightweight as they are printed onto polyester fabric and the hardware is largely aluminium.These displays have proved very popular with international travellers because they are so compact, lightweight and easy to assemble. They also make attractive and modern looking point of sale displays. For systems with graphics up to 65cm wide, we use a 3 sectional vertical pole to keep the system as small and compact as possible. The whole system fits into a tough nylon carry case measuring 74cm in width x approx 10cm in height. For 80cm wide systems, we use a 2 sectional vertical pole and the whole system fits into a carry case measuring 108cm in width x approx 10cm in height. As the graphic is independent of the vertical pole and base, it is easy to change. This also allows for graphics of different heights to be applied to the system – so if you just wanted a graphic that covers the top half of the stand, that is no problem as shown below. The system can also be made double sided by using a different clip set and adding a second fabric graphic with rails to the rear of the display.The base used in all of the examples shown is the folding crossbase. However, there is an alternative base to this called a square plate base. It is a 33cm square aluminium plate and this is sometimes used for semi-permanent displays. For more information about the flexibility of the system, see the Features and FLEXibility section which explains this in more depth. The crossbase stand has been designed with the user in mind and assembly is very simple. Each display comprises a base, pole, clip set and fabric graphic.